It’s that time of year again, Halloween is almost here! Pumpkins are being carved, spooky decor is appearing all over the neighborhood, and costumes are getting their last minute touches. These are just a few of the fall traditions that we look forward to every year. From 2011-2015, U.S. fire departments responded to an estimated average of 840 home structure fires per year that began with decorations. These fires caused an average of 2 civilian deaths, 36 civilian injuries, and $11.4 million in direct property damage, per year. 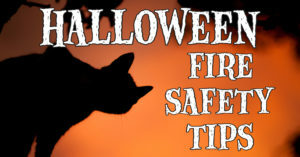 Fire can start when candles are too close to decorations or when long, trailing costumes come into contact with candles. • When choosing a costume, stay away from long trailing fabric. If your child is wearing a mask, make sure the eye holes are large enough so he or she can see out. • Keep all decorations away from open flames and other heat sources like light bulbs and heaters. • Use a battery-operated candle or glow-stick in jack-o-lanterns. • Remember to keep exits clear of decorations, so nothing blocks escape routes. For more safety tips, download the NFPA’s Halloween Fire Safety Tips Sheet here.